Check out these beautiful and amazing fashionable sets that have been put together with YOU in mind. We have some amazing, completely unique jewelry for sale! Comment below with your email address, or email sosfinerthings@outlook.com if you are interested in purchasing our one-of-a-kind sets. The prices are listed with every product. We have a flat rate of $4.99 for shipping. Most of the time we only have one of each so act now. First come first served! Happy shopping. 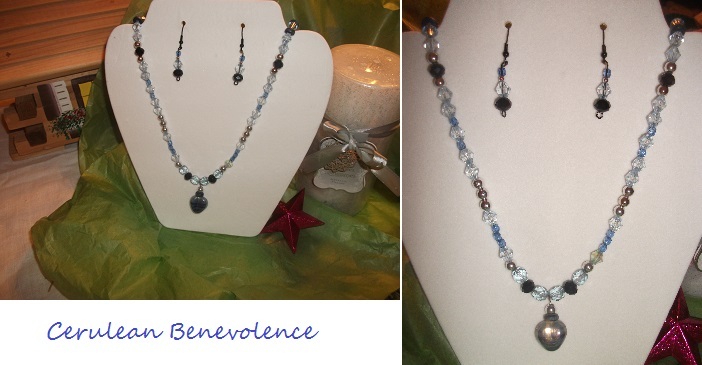 This necklace and earring set has beautiful sparkling blue crystals accented with blue, silver, and black beads. It has a gorgeous heart-inspired metallic pendant with blue and silver swirls. Gorgeous silver cross earrings. What better way to express your faith this Christmas season than to wear these beautifully designed earrings? $9.99. Set #1: Filigree cross earrings with reflective black rhinestones. Gorgeous detail! Set #2: Compliment your outfit with these silver cross earrings with interesting diagonal lines and scrolls designs! 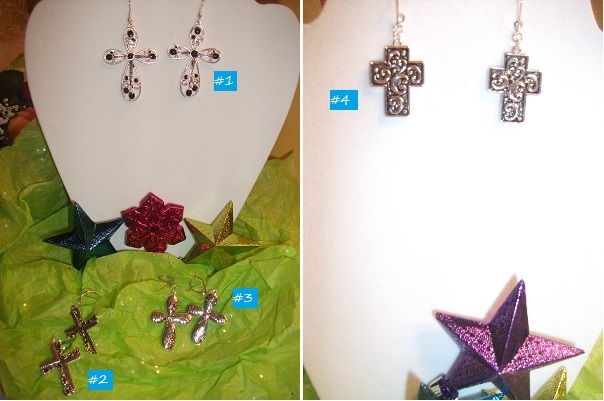 Set #3: These silver cross earrings are decorated with a delicate floral design. Set #4: These earrings can make a bold statement! Slightly darkened background with a scrolled design. Wear them casual with jeans or dress them up for work or social events! Set 1: Faux pearl drop earrings with gorgeous blue rosettes and a statement cuff bracelet that has faux pearls, a blue rosette, and a stunning flower pendant. 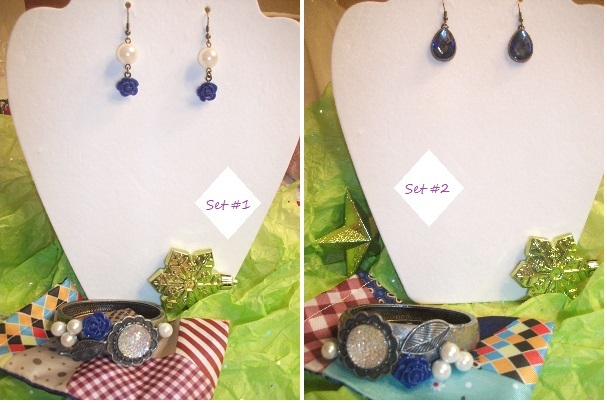 Set 2: Sparkly blue rhinestone drop earrings and a statement cuff bracelet that has faux pearls, a blue rosette, and a stunning flower pendant. Both bracelets are delicately inscribed with the word “grace” on the backside of the bracelets. 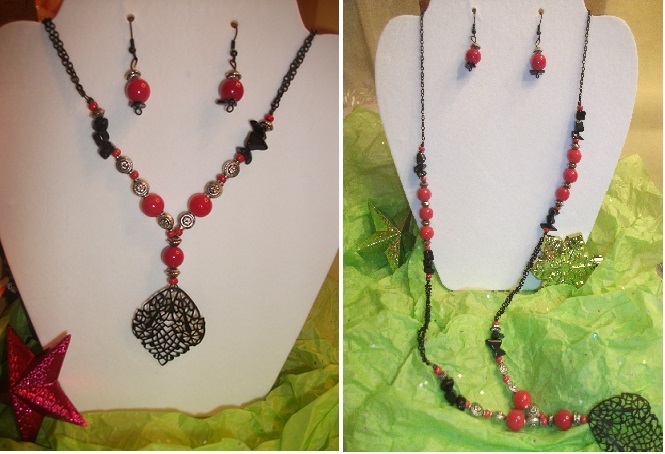 This beautiful handmade red, black and silver beaded necklace has a flattering length, a stunning filigree pendant, and comes with matching earrings. 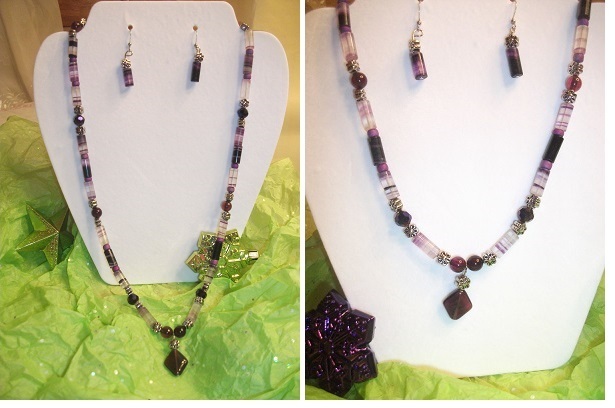 Make a statement this holiday season with this magnificent set. Purple glass beaded handmade necklace with silver flower accents and matching drop earrings, also with silver flower accents. An amazing pink crystal bead is front and center on this one-of-a-kind necklace. It has black oval-shaped beads with gold flecks in it. 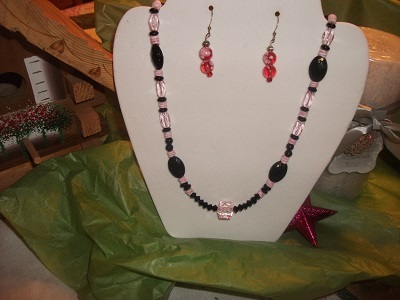 There are black and pink opaque beads and pink crystals throughout. The earrings are a pink-red color with pink and white dots of color.